The vote was 20-17 against the assault weapon ban, with two Republicans joining all of the senate's 15 Democrats in support of the proposal, the Miami Herald reported. 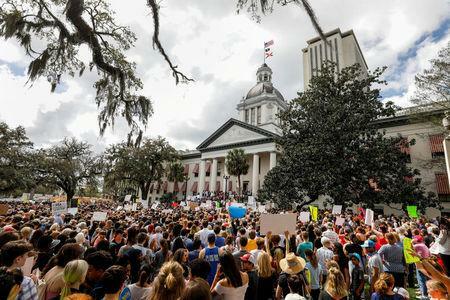 After the Senate rejected the ban, Stoneman Douglas student Jaclyn Corin tweeted, "This breaks my heart, but we will NOT let this ruin our movement. This is for the kids." Fellow classmate David Hogg, who has become one of the school's leading activists on gun safety, tweeted, "Elections are going to be fun!" Nikolas Cruz, the accused 19-year-old killer who was expelled from Stoneman Douglas, had a history of run-ins with the law and school officials. The Broward County school system and sheriff's department have been criticized for not acting on red flags on Cruz's mental health problems and potentially violent behavior.